In a world where there are multiple hybrid options and a movement toward alternative fuel sources, it’s refreshing to see one company find a way to give us more power from a massive power plant that can get the job done. FCA has given us the Hellcat engine in the Dodge Charger and Challenger to start with and then started looking for other places to put this massive engine. 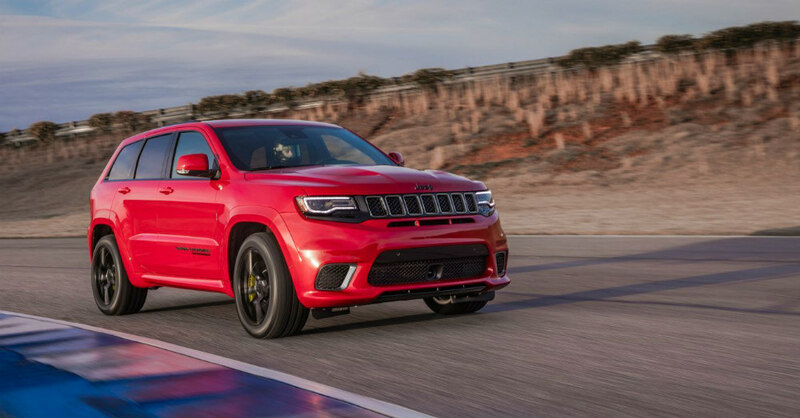 The found the right place with the Jeep Grand Cherokee and offers us the Trackhawk which makes use of the incredible 6.2-liter supercharged V8 engine to offer us some amazing performance features. Performance Numbers – Numbers don’t lie and when the power under the hood is coming from the Hellcat engine with its 2.3-liter supercharger, you know you’re going to have a great ride. This AWD Grand Cherokee Trackhawk is capable of reaching sixty mph in only 3.5 seconds and continue on to finish a quarter mile in 11.6 seconds while reaching a top speed of 180 mph, all of with are incredible numbers to witness for this amazing vehicle. A Sleeper – You would think the Hellcat engine would be one that would make a lot of noise in the Trackhawk Grand Cherokee, but it doesn’t. In fact, if you pull up at a stop light, people who pull up next to you will have little idea of what you have for the drive under the hood of this SUV. That’s just fine when it’s time to race someone off the line when you take this brute out to the track. Quiet – FCA did the right thing by making sure the Jeep Grand Cherokee Trackhawk is one that’s fairly quiet. This is an SUV that can be used by families on most days and it can easily be one that will take you where you need to go. Because of the family feeling of this SUV, the need is in place for it to be quiet on the road so that everyone can enjoy the experience and this Jeep is excellent at being quiet on the road. Launch Control – You associate Launch Control with sports cars that need to be able to rocket off the line quickly, but even when you match a large Jeep with the power of this impressive sports car engine, you can have some sport features added. This Jeep has Launch Control to make sure you can rocket off the line quickly in order to have an amazing ride on a drag strip. Hauling You Need – The power found in the Hellcat engine is plentiful for you and its put to use for the hauling behind this SUV as well. The Trackhawk can tow up to 7,200 pounds behind the vehicle to allow you to take a boat or trailer where you need to go when you’re ready to get out on the road. This makes the Grand Cherokee Trackhawk and SUV that’s more practical for the driving you want to do on a daily basis. Not Efficient – If you’re looking for a vehicle that offers you a large number when it comes to fuel mileage, look elsewhere. This is a big SUV with a massive engine under the hood that shows up with 11 city/17 hwy mpg which are numbers that certainly won’t impress anyone. Even so, you will have an excellent drive, just realize you’re going to fill it up often. Eco Mode – It may sound ridiculous when it comes to a vehicle that lacks the efficiency of this model, but the Grand Cherokee Trackhawk has an Eco mode that gives you the ability to change the transmission shift schedule by starting out in second gear when you being from a start. This also allows you to reduce the maximum torque used to 500 lb.-ft. making this version feel tuned down. Still the Grand Cherokee – Even in the Trackhawk build, you still have the benefits of what a Grand Cherokee can be for the drive you want with the package that offers you the items you’re looking for including an Uconnect infotainment system, and several other items for the drive on the road in the SUV you want to drive.